Players carry golf accessories in additon to clubs, balls and tees. Golfers have individual preferences about what to carry in their golf bag, but some basics apply. Clubs include a driver, some irons, possibly some hybrids, wedges and a putter. In addition, many bags include accessories that make golf more fun and convenient when you are on the course. 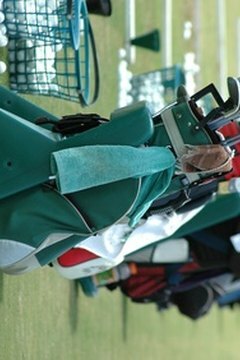 United States Golf Association rules allow the golfer to carry 14 clubs. Most golfers will carry a driver to hit long shots off the tee, along with two or three fairway woods. Beginners and high handicappers can stick with more lofted woods like the 5-, 7- and even the 9-wood. More advanced players typically use a 3-wood and a 5-wood. The traditional set of golf clubs comes with irons from the 3-iron to the 9-iron. In addition, most golfers carry a pitching wedge and a sand wedge. Experienced players looking for more accuracy in their short game can add a gap wedge with a loft that falls between the pitching wedge and the sand wedge, and a lob wedge for very short shots. Technological advances have produced clubs that combine the features of woods with the features of irons. These hybrids have shafts that are shorter than woods so they are easier to hit. In addition, hybrids have a larger club face to provide a big sweet spot that is more forgiving of mis-hits. Hybrid clubs such as the 3-hybrid and the 5-hybrid can replace long irons like the 3-, 4- and 5-iron. Golfers carry all sorts of accessories along with the basics like balls, tees and golf gloves. Ball markers that clip onto a golf hat are popular, as well as whimsical clubhead covers and insulated bags to keep beverages cold on the course. Towels to wipe down clubs after use also may be included. Many golfers keep an umbrella and rain or wind clothing available for inclement weather, along with a cover for the golf bag to protect the clubs. Many golfers enjoy using hand-held GPS systems that give the distance from the ball to a hazard for a layup shot, and from the ball to the flag. Some of these systems have limited capability, like a 10-course limit at any given time. Other GPS systems allow the golfer to go online to download courses worldwide. What Golf Clubs Do I Need to Play Golf?